To determ ine the issue or issues, the maintenance provider should evaluate leaks in the fixtures, excess water use, poor wastewater quality, or determine if the screen is not adequately sized for that application. 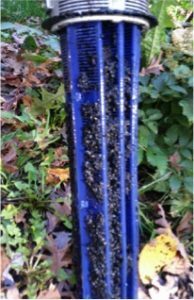 Clogging of screens should not be considered an indication of a problem with the screen unit since the purpose of a screen is to catch suspended solids. Rather, premature clogging may be an indicator of problems such as reduced detention time due to excessive or heavy flows. If an effluent screen seems to need excessive cleaning, it may be that the homeowner has too many solids, chemicals or too much water going down the drains. Large volumes of wastewater generated in a short period of time can result in turbulence in the septic tank and reduced retention time, which can lead to solids plugging the effluent screen. Do not do all the laundry in one day. Spread wash loads throughout the week and wash at times when there is not a lot of water being used in the home. Do not run multiple water-using devices at the same time, such as showering or running the dishwasher while doing the laundry. 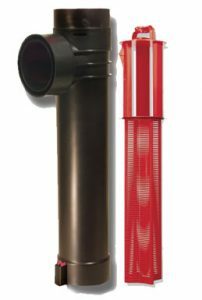 Disconnect water treatment devices such as iron removers, reverse osmosis and water conditioners from the septic system. The discharge water from these devices does not need further treatment (consult local regulations) and can add significant amounts of clean water to the system. Garbage disposals are notorious for adding solids to a septic tank. Minimize the use of the garbage disposal, or eliminate its use altogether by placing food scraps into a compost bin or trash can. Washing machines can add a significant amount of lint to your septic tank. Avoid this by placing a lint filter on the end of the outlet hose. Limit the use of bleach. Do not use liquid fabric softeners or degreasers, which can cause the tank to not naturally stratify. Do not use the toilet as a trash can. Nothing other than human waste and toilet paper should be flushed. Do not flush tissues, hygiene products, cigarette butts, etc. Reduce the amount of strong cleaning chemicals and antibacterial soaps used in the home. Bleach and other antibacterials can kill the beneficial bacteria in the septic tank, reducing the rate of solids decomposition. Do not flush unused or expired medications. 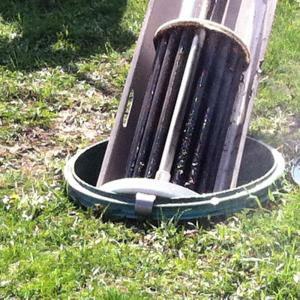 These products can kill the beneficial bacteria in your septic tank. Inform your septic professional of any prescription or over the counter use. Consider any in-home business or hobby that may be adding excess water or solids to your septic system. Do not use products advertised as septic additives or septic cleaners. 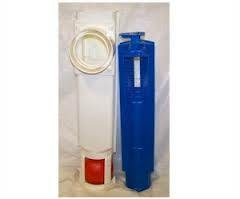 These products are not necessary, may suspend solids and kill the beneficial bacteria in your septic tank. Call the technicians at WSS today for your effluent filter maintenance! We supply regular maintenance on septic tanks and effluent filters – we think about it so you don’t have to! Wm. 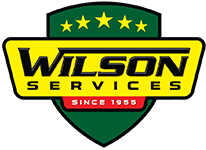 H. Wilson Enterprises/ Wilson Services 973-383-2112 Contact us today!